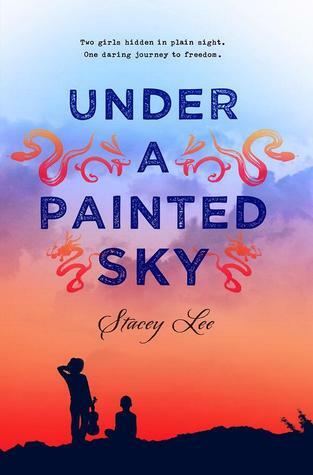 As a member of the Fearless Fiteeners, I was able to read an ARC of Stacey Lee’s young adult novel, Under a Painted Sky (3/17/2015; Putnam Juvenile). ARCs (Advanced Reader Copies) are the uncorrected proofs that are sent to reviewers, librarians, and book bloggers to promote the book. My fellow fifteeners and 2k15 classmates are sending their ARCs on tour, which allows us a sneak peek at these upcoming new releases. I’ve decided to let you all know about the ARCs I’m reading to help support my 2015 debut colleagues. Here’s the description: Missouri, 1849: Samantha dreams of moving back to New York to be a professional musician—not an easy thing if you’re a girl, and harder still if you’re Chinese. But a tragic accident dashes any hopes of fulfilling her dream, and instead, leaves her fearing for her life. With the help of a runaway slave named Annamae, Samantha flees town for the unknown frontier. But life on the Oregon Trail is unsafe for two girls, so they disguise themselves as Sammy and Andy, two boys headed for the California gold rush. Sammy and Andy forge a powerful bond as they each search for a link to their past, and struggle to avoid any unwanted attention. But when they cross paths with a band of cowboys, the light-hearted troupe turn out to be unexpected allies. With the law closing in on them and new setbacks coming each day, the girls quickly learn that there are not many places to hide on the open trail. What I liked about it: I don’t usually read historical fiction, partly because I had to teach really boring ones to coincide with my school’s US History curriculum during my first few years of teaching. The experience turned me off to the genre for a long time, yet I loved Under a Painted Sky so much that I stayed awake until 3 a.m. to finish it! Stacey Lee’s debut novel is anything but boring. Within the first few chapters, people die and Samantha and Annamae run away and become wanted fugitives. Dressed as boys, Sammy and Andy meet up with Cay, West, and Peety, three cowboys who help them on the danger-filled trek to California. The characters living out this adventure are layered and relatable. I loved Samantha and Annamae’s friendship from the start, and the cowboys add fun, romance, and more trouble to the story. The diversity in the novel is also worth mentioning. Samantha is Chinese, Annamae is an escaped slave, Peety is Mexican, and they meet Scottish and French people, among others, on their journey. Because of the different backgrounds, Lee seamlessly weaves in the social norms of the time, Christian beliefs, the Chinese zodiac, French, and Spanish. Under a Painted Sky can be read for fun or used in a school’s history or language arts curriculum. Do yourself a favor and add it to your To Be Read list! About the author: Stacey Lee is a fourth generation Chinese-American whose people came to California during the heydays of the cowboys. She believes she still has a bit of cowboy dust in her soul. A native of southern California, she graduated from UCLA then got her law degree at UC Davis King Hall. After practicing law in the Silicon Valley for several years, she finally took up the pen because she wanted the perks of being able to nap during the day, and it was easier than moving to Spain. She plays classical piano, raises children, and writes YA fiction.